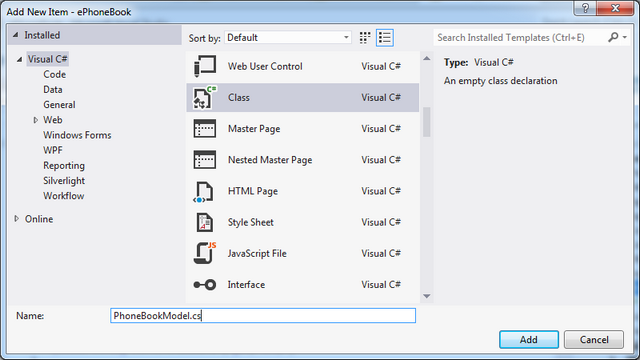 You can use ASP.NET MVC 4 with Visual Studio 2010 and 2012. As of now previous visual studio versions doesn't support ASP.NET MVC 4. 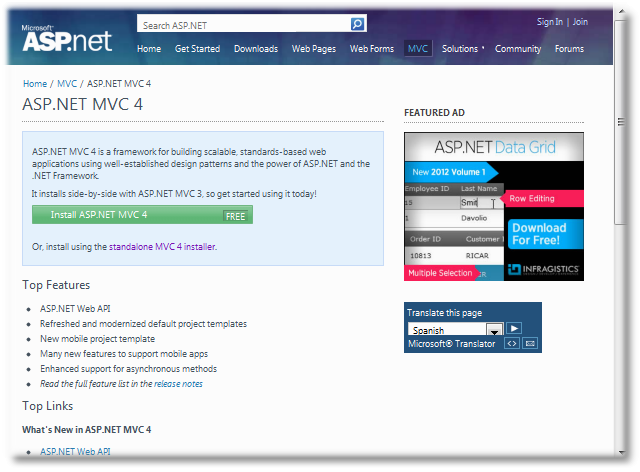 This article will guide you through the step by step installation of ASP.NET MVC 4. 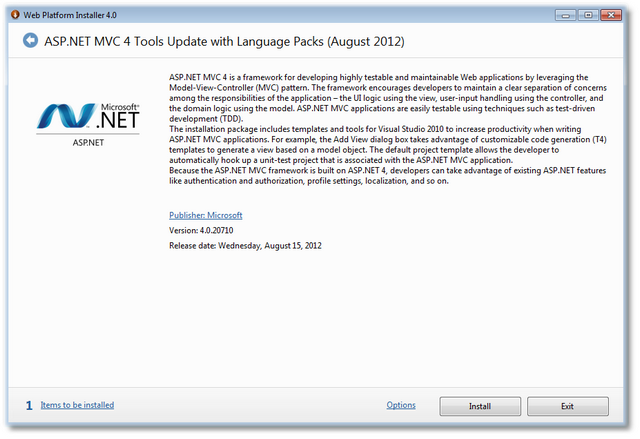 Visual Studio 2012 is already packaged with ASP.NET MVC 4. 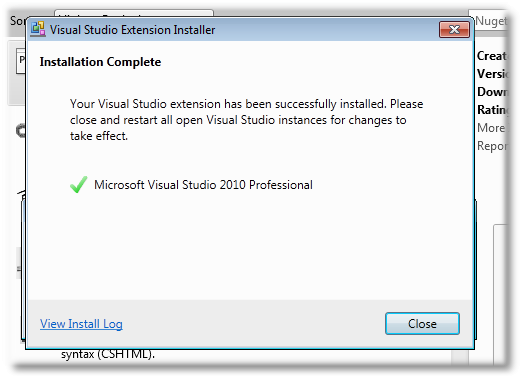 Visual Studio 2010 was packaged with MVC 2 as MVC 3 and MVC 4 was released after Visual Studio 2010 release. 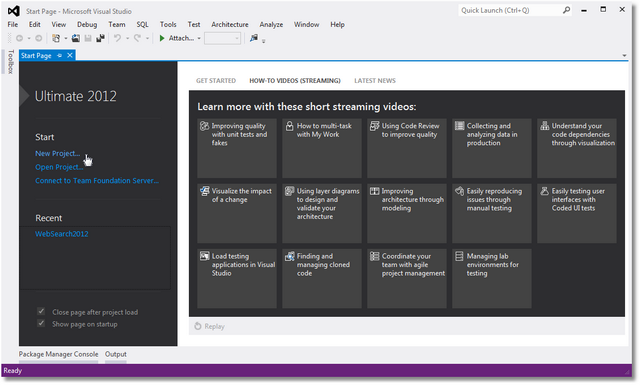 Visual Studio 2012 Express (Free) version also comes with ASP.NET MVC 4. To Install ASP.NET MVC 4 to Visual Studio 2010, you must have SP1 installed for VS 2010, If you don't have Service Pack 1 installed for Visual Studio then please click here. This service pack is also available in .ISO format. 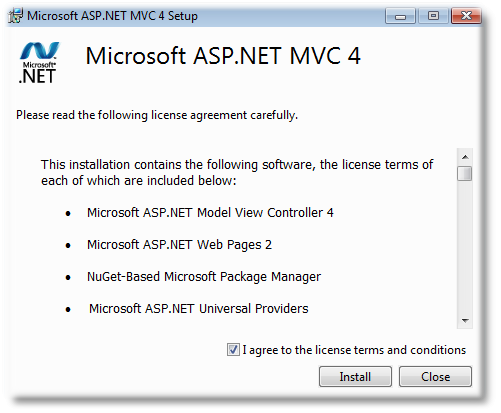 There are multiple options available for ASP.NET MVC 4 installation. You may choose the one from the below option. 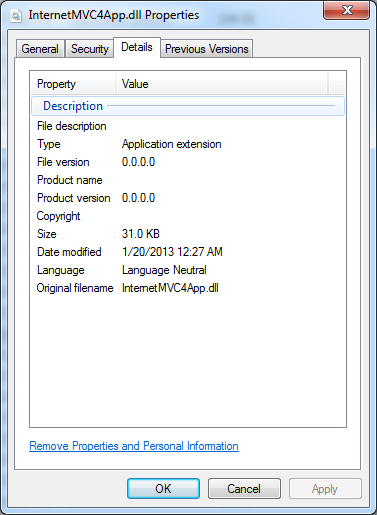 There are three different options for installing ASP.NET MVC 4 for Visual Studio 2010. 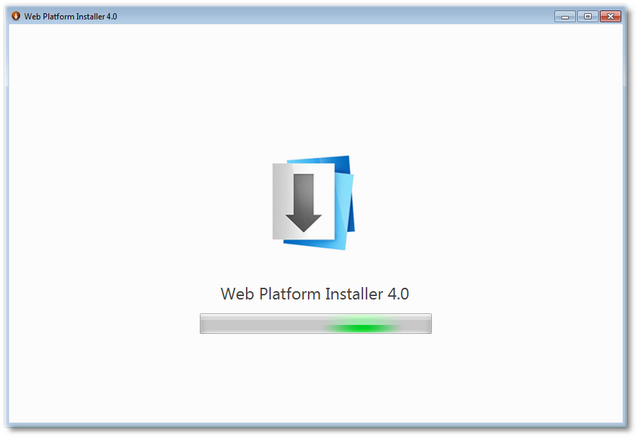 ASP.NET MVC 4 Web Platform Installer for Visual Studio 2010 SP1. 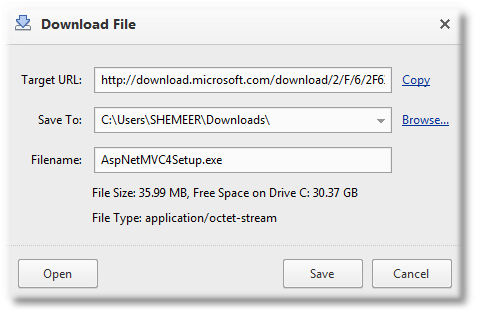 Download the standalone ASP.NET MVC 4 installer executable. I will be explaining all these options from a beginner's perspective. 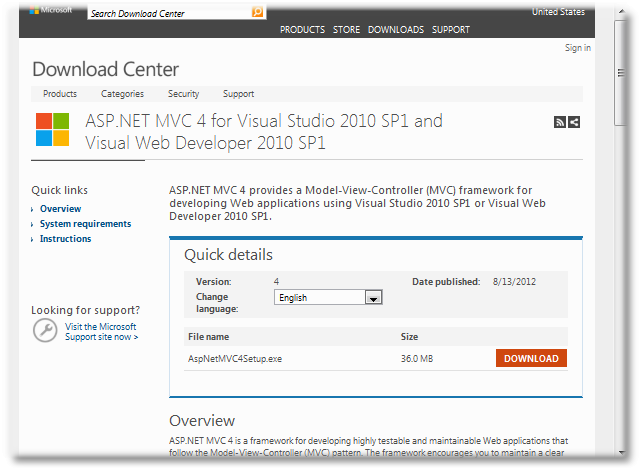 Click on the "Install ASP.NET MVC 4" button. Click on "Install Now" button. That will popup a save dialog as per your web browser setting. 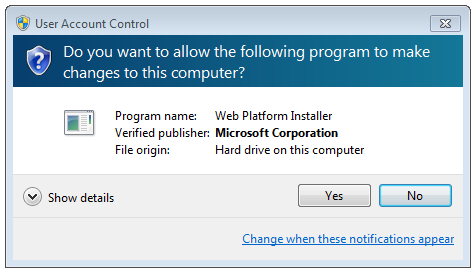 To continue with installation click on "Install" button, and Accept the Licence terms by clicking "Accept" button. 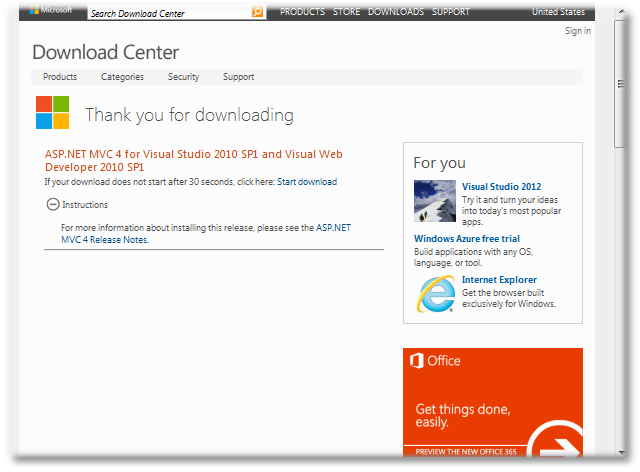 Once you "Accepted" then it will download and install ASP.NET MVC 4. 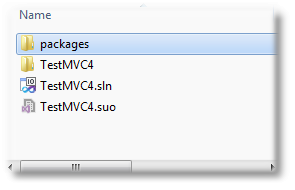 If you want to have a copy of the setup file or if you have multiple machines that needs to be setup with MVC 4 then standalone installer is the right option. Click Download and Save the file to a particular location. Once you have clicked on the above button then you will get the "Installation" UI. 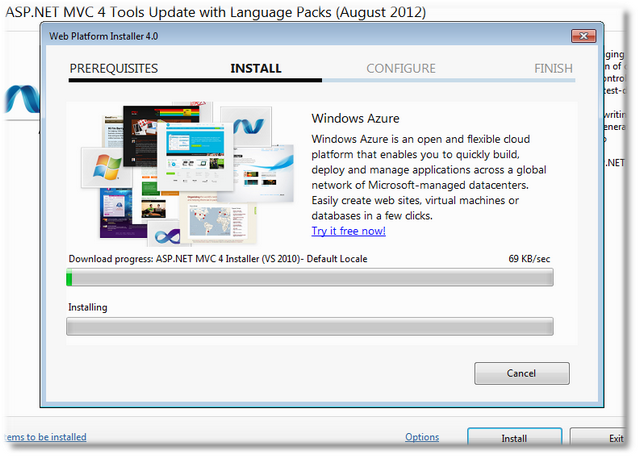 By clicking the above "Install" button, ASP.NET MVC 4 will be installed for Visual Studio 2010 SP 1. To know more about ASP.NET MVC 4 NuGet package, please click here. 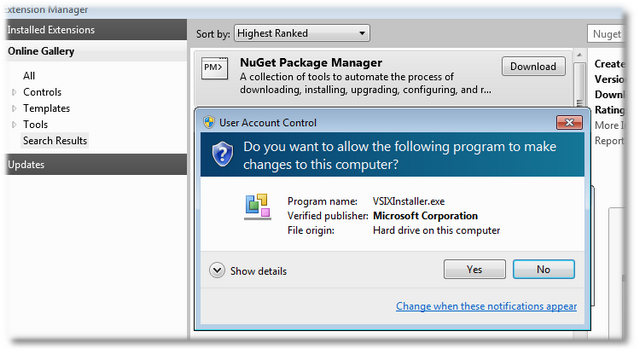 If you have already NuGet package manager installed then you will get the below menu option. Once it's done you can see that the references are added to the project. ASP.NET MVC 4 is a framework for building scalable, standards-based web applicationsusing well-established design patterns and the power of ASP.NET and the .NET Framework.In this article I will give an introduction to ASP.NET MVC 4 from a beginner’s perspective. Currently ASP>NET MVC 4 is supported in Visual Studio 2010 and Visual Studio 2012, previous versions of Visual Studio does not support ASP.NET MVC 4 as of now. 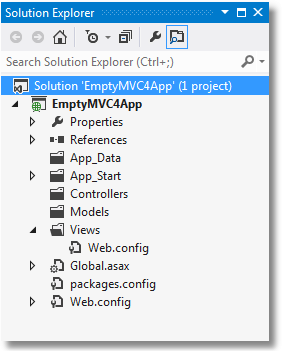 If you don’t have ASP.NET MVC 4 in your box then install MVC 4 for Visual Studio 2010 or else use Visual Studio 2012 to get started with this article, You may refer Setup Environment article for more installation details/procedures. 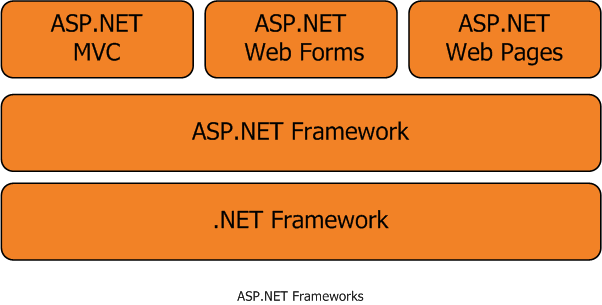 ASP.NET supports three different development models named Web Pages, MVC and Web Forms. ASP.NET MVC is a web application development framework built on top of Microsoft’s .NET Framework. 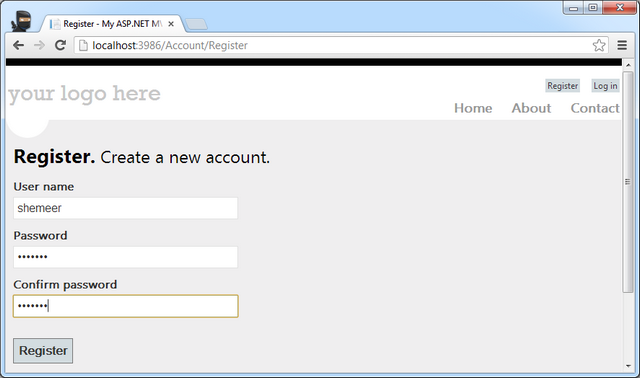 ASP.NET Web Form was a replacement for Microsoft’s Active Server Pages (ASP) but ASP.NET MVC is not a replacement for ASP.NET Web Forms and it’s just an alternate way of making an ASP.NET website. ASP.NET MVC is open source!- In March 2012, Scott Guthrie announced on his blog that Microsoft had released part of their web stack (including ASP.NET MVC, Razor and Web API) under an open source license (Apache License 2.0). ASP.NET MVC helps to reduce the complexity of the web application by dividing an application into three layers, Model, View and Controller. This separation (loose coupling) helps in some long term benefits like isolation of components while development and also this separation provides better support for test-driven development (TDD). ASP.NET MVC web site are good in performance and also easy to maintain. 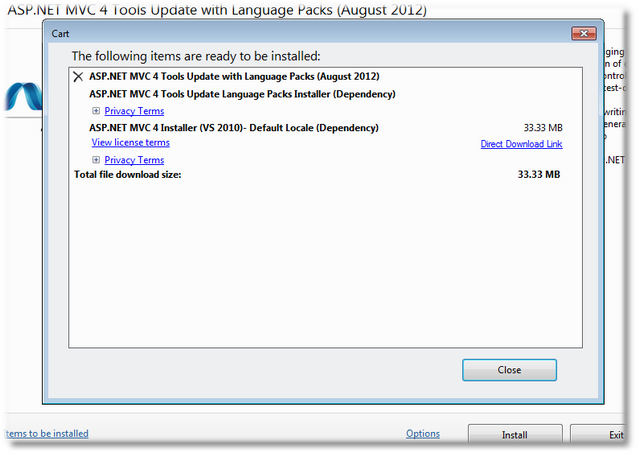 The Current Version of ASP.NET MVC is 4 and it was released on 15th Aug 2012. 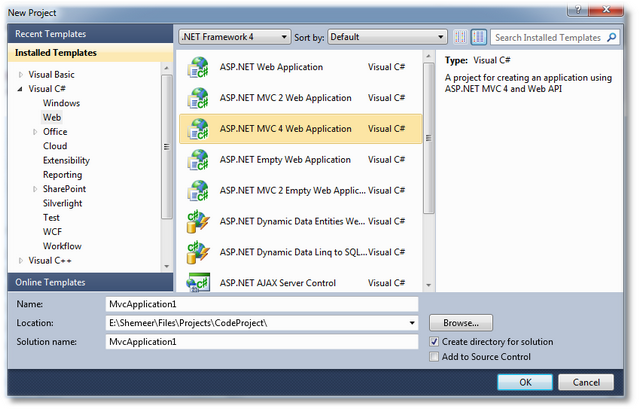 ASP.NET MVC 4 is packaged with Visual Studio 2012 and MVC 4 can be installed for Visual Studio 2010. Below I have mentioned the release history of ASP.NET MVC. In this article we are discussing more about the latest version of MVC, that's MVC 4. Read more from Wikipedia on MVC Release History. 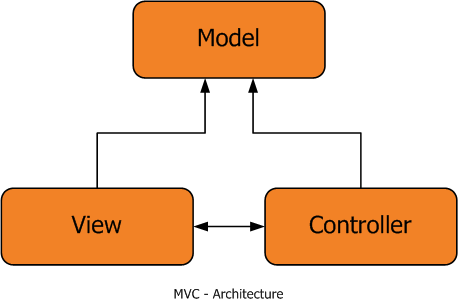 The Model-View-Controller (MVC) pattern is an architectural design principle that separates the application components of a Web application into three layers. This separation gives you more control over the individual parts of the application, which lets you more easily develop, modify, and test them. Model contains and exposes the properties and application logic In a better way we can say that The model represents core business logic and data. 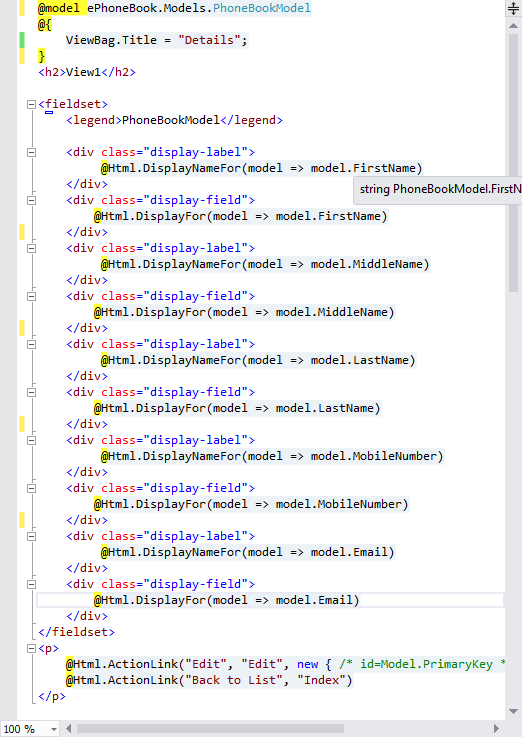 In the ePhoneBook Sample the 'PhoneBookModel' class represents the properties of a “Phone Book” in the application and may expose properties such as First Name, Last Name and Mobile Number etc and also it may expose methods. The View is responsible for creating the response HTML or any responses back to the browser like pdf, html or excel etc. In other way we can sat that the view is responsible for transforming a model or models into a visual representation. Controller is responsible for processing user inputs from view and give responses back to the view. It means that the controller decides the action and performs the tasks/logic based on the parameters.Controller acts as the coordinator between the view and the model. ASP.NET Web form is very rich with server controls but in ASP.NET MVC there are no server controls supported and its fully depend on HTML controls. If you look at the below image you can see that no server controls are present in the toolbox. There is no View State in ASP.NET MVC. 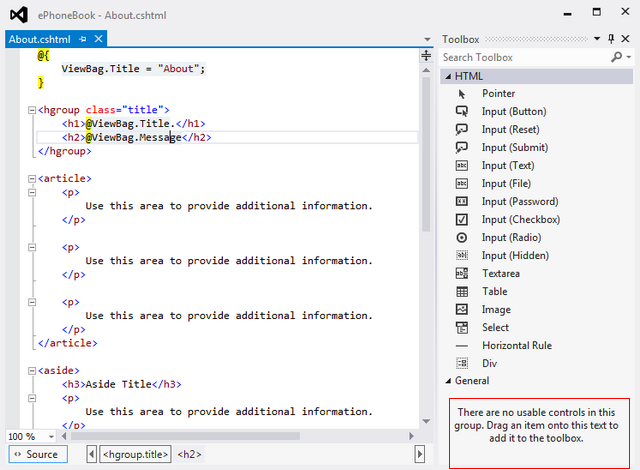 we can use HtmlHelpers in ASP.NET MVC for rendering HTML controls in a view. ASP.NET MVC is based on Separation Of Concerns that's why ASP.NET MVC is pluggable and flexible system. 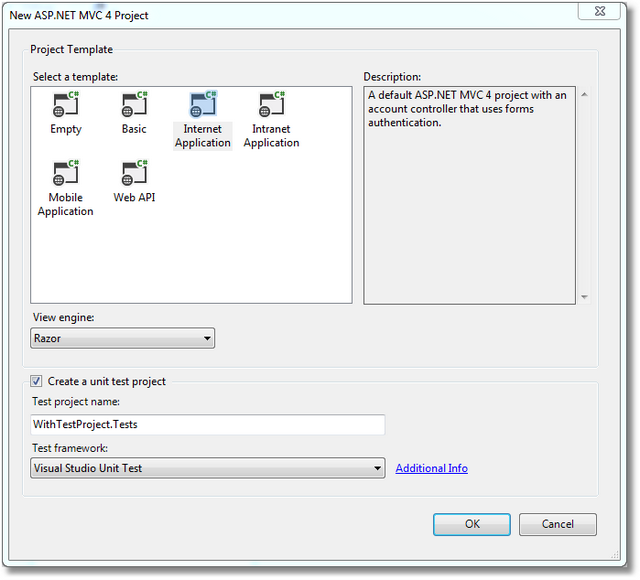 Implementing Test projects with ASP.NET MVC is simple than Web forms. 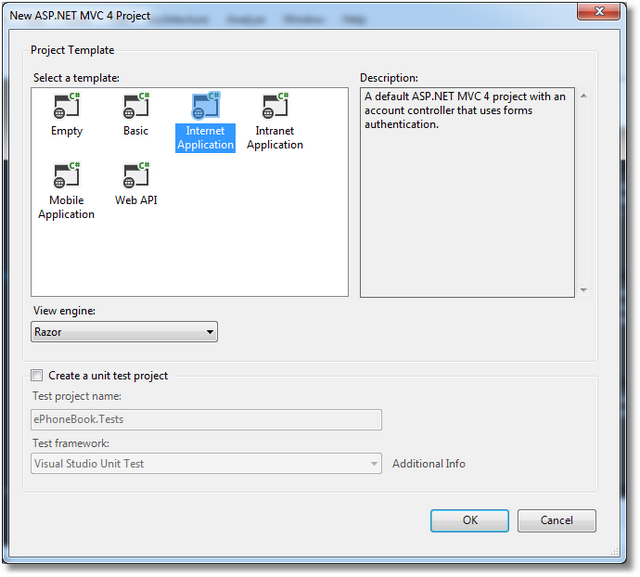 ASP.NET MVC request cycle is very simpler than Web forms and MVC gives a good performance. In my opinion I feel for a Web form developer, ASP.NET MVC is difficult to learn and understand as its much into coding not much drag and drop but once its fully understood then its very easy. Layout page is the Master page available in ASP.NET MVC and partial views can be considered as a replacement of user control in Web form. 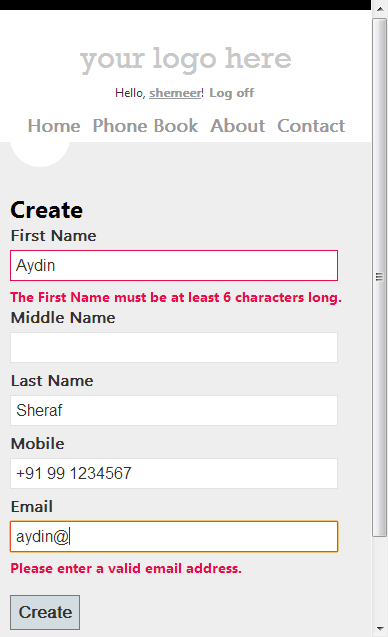 Web form uses normal Web-form syntax where as MVC app uses customizable syntax default to Razor. There are many more similarities and differences, Once you start writing code with ASP.NET MVC you will learn more. 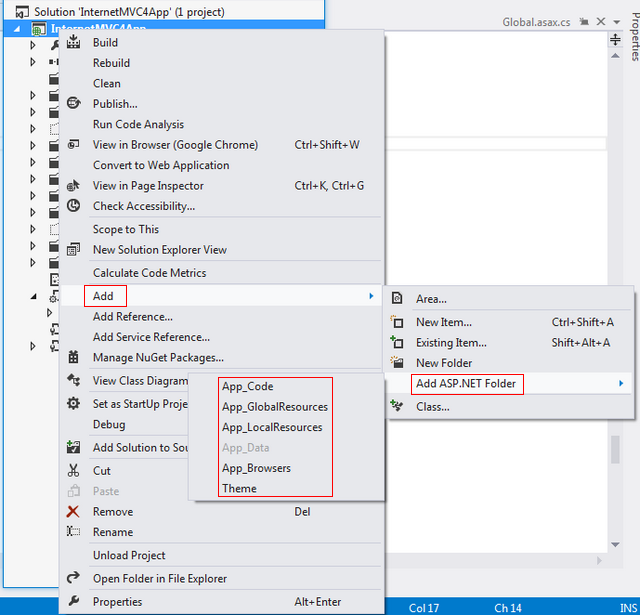 In this article all screen shots are based out of Visual Studio 2012 but If you are using Visual Studio 2010 then you will find similar UIs there too.To Create a new MVC 4 application we need to click on 'New Project' menu. 'New Project' menu can be accessed from the start page itself or File->New->Project menu. The below given image shows how to create a New Project from start page. Creating New Project from File->New->Project. Clicking on New Project menu will show a popup for selecting the required type of Project from the installed templates list. We can create Windows Application or normal ASP.NET Web Application etc using this popup but now we are more interested to create a new ASP.NET MVC 4 Web Application from scratch. Give a proper name for this new MVC 4 application and click 'OK' button. 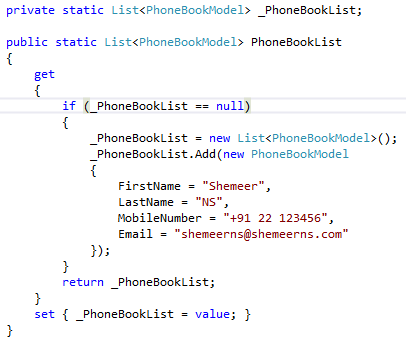 I have given 'ePhoneBook' name as I'm going to use this project for all my MVC 4 series. Select appropriate Project Template (discussed in another section), View Engine and also if you want you can opt for creating a Test Project for this application. You can create a test project later also if you don't want to do right now. 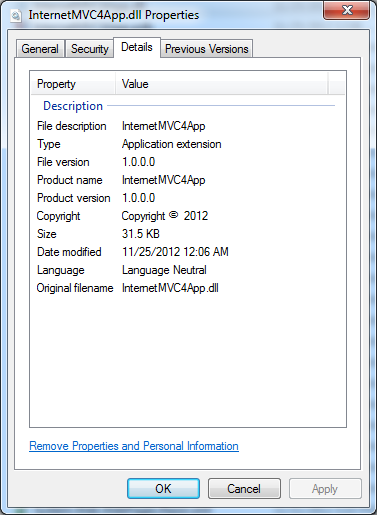 I have selected the Internet Application with Razor View Engine. View Engine are responsible for rendering the HTML from your views to the browser. The view engine template will have different syntax for implementation. Currently there are few number of view engines available for MVC and the top four view engines are Razor, traditional ASPX, Spark and NHaml. I have written another article on comparison of different view engines. Razor is the preferred View Engine for MVC, ASPX View Engine is the legacy View Engine and this option is there for backward compatibility. I will be explaining more about Razor on another article. 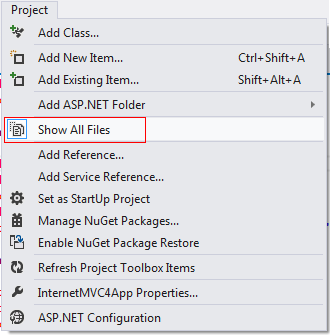 Once you click 'OK' after selecting the appropriate project template Visual Studio will create a MVC Web Application project with default files and folders as per the Template Selection. 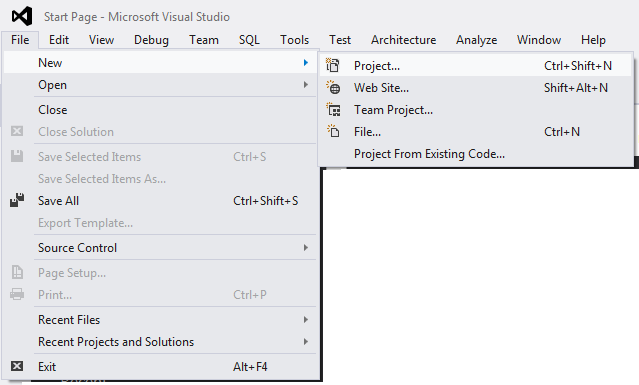 If look at the visual studio status bar you can see that the project creation progress and the files adding to the project. 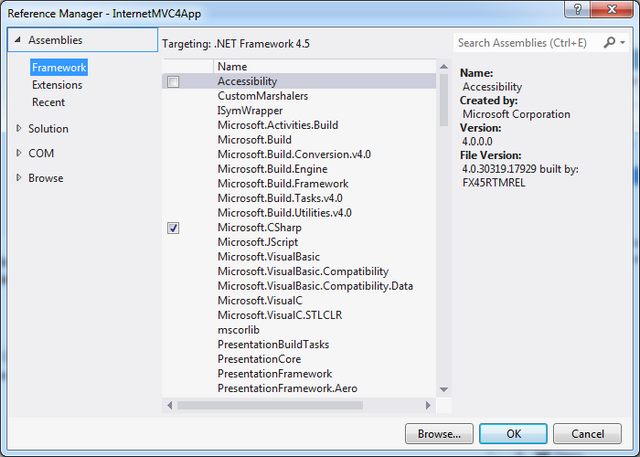 ASP.NET MVC 4 project template is using Nuget Package Manager to install and manage the assembly references in your application. 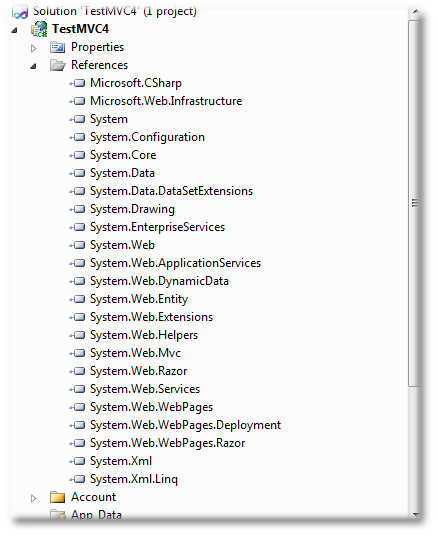 the below files in status bar adding by Nuget. 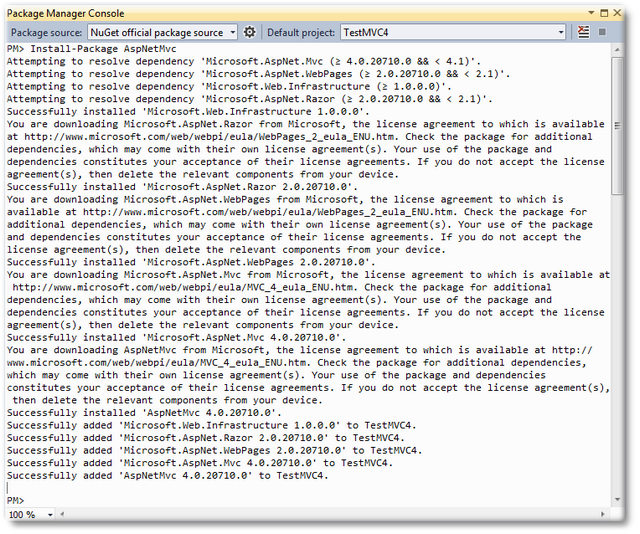 Package.Config File contains the list of the Nuget Package used in this project. I have explained the Project Items/ Application folder structure in another article, before continuing with our newly created project I just wanted to explain the Project Templates. I will be explaining the Basic, Empty, Internet Application, Intranet Application, Mobile Application and Web API project templates here. 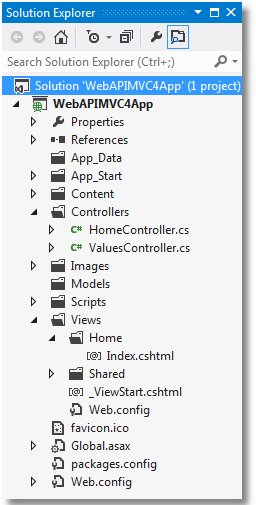 The Empty template created the minimum references and resources required to run an Asp.net MVC application.As you can see in below image, Models, Controllers, App_Data are completely empty folders and View folder only contains web.config and a Global.asax file and web.config.App_Start folder contains 3 configuration files ( FilterConfig.cs, RouteConfige.cs and WebApiConfig.cs ). This option will be good if you plan to create everything from scratch. After comparing the Empty project image and Basic project image we can say that The Basic template is somewhat similar to Empty template. In addition to the Empty project , Content , Script folder are present in this template and Shared folder is present inside Views and also in App_Start folder apart from the three files in empty template, basic template added one more file named BundleConfig.cs (Bundling and minimization). Same like Empty Template,this option also good if you plan to create everything from scratch. The Internet Application extends Basic Template with two controllers( Account controller and Home controller) with all the logic and functionality implemented in actions and views. In this template membership management functionality gives the option to user to register and login, change password etc in the website. It's a template used usually to start a normal web project in action. The Intranet Application template is same like the Internet Application template, except that it is preconfigured to use Windows-based authentication. This template will be a good option if you plan to create an intranet web site. If you plan to target touch based mobile devices then this template is the right option. The Web API template is yet another variation of the Internet Application template that includes a preconfigured Web API controller.ASP.NET Web API is a framework that makes it easy to build HTTP services that reach a broad range of clients, including browsers and mobile devices. ASP.NET Web API is an ideal platform for building RESTful applications on the .NET Framework. Web API is a great choice for quickly and easily creating data services that your AJAX-enabled applications can easily consume. If we want to create a Test project while creating the MVC project itself then we need to mark the Create Unit Test Project Check box. If you don't want to do this at the first time you can add a unit test project later also. 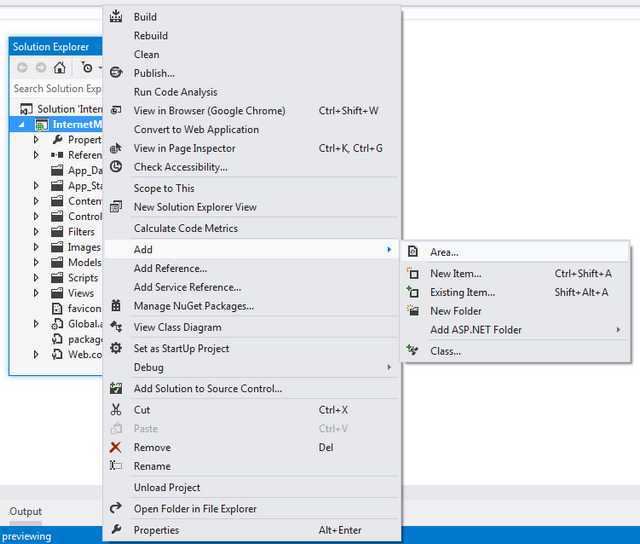 If we are creating MVC Application with Test project then the solution explorer will look like below . Now we will run our newly created ePhoneBook application. We can run this in debug mode or without debug. 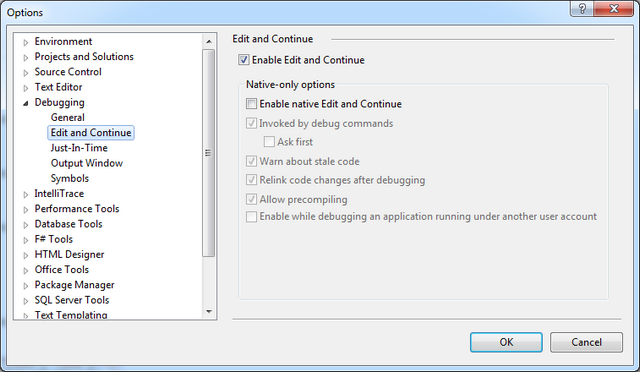 To run this go to the Menu Debug->Start Debugging/Start without debugging. 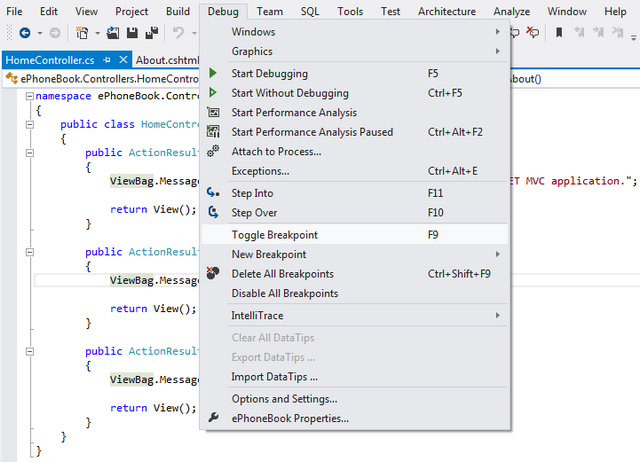 The run command is also there in the Standard Toolbar, the below given image shows the run toolbar in VS 2012 IDE. If you want to debug your application then you need to set a break-point at the location where you want to hit the debugger. 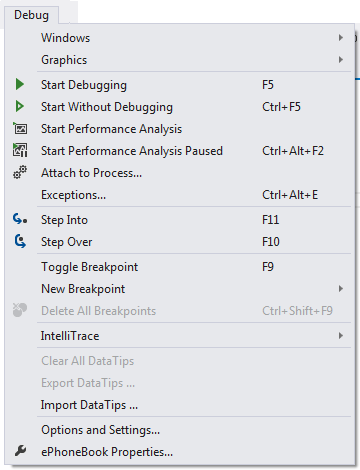 To set breakpoints just go to the menu Debug->Toggle Breakpoint. You can use the shortcut key F9 also for the same. you might want to note the short keys for Step Into (F11) and Step Over (F10). Once you hit the breakpoint you can resume debugging by pressing F5. To demonstrate the debugging I have placed two breakpoints, one in Home Controller – About() and About.cshtml. When I clicked on About Menu the first break point got hit. You can Step Over by F10 or just resume to the next breakpoint by F5. I pressed F5 and the second breakpoint got hit. If you want see the value then you can see in watch window and also there are other windows too, to add a object to Watch Window, select the required object and right click and click on AddWatch. Have you noticed that the url is very user friendly with no extensions and all. 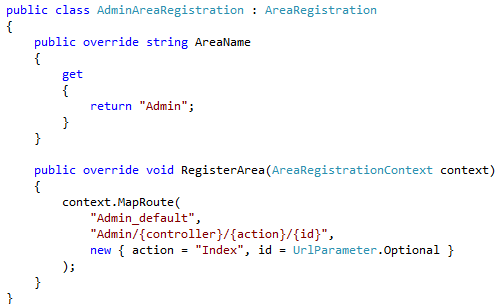 The ASP.NET MVC routing takes care of this URL routing. Read more on routing on MSDN. 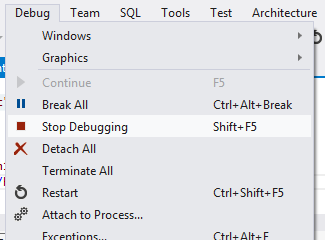 To stop debugging you need to press Shift + F5 or go to the Debug menu and click on Stop Debugging. You can see that the Menus like Home, About Contact was shown from this Layout. So how this page is called? So where the content page is placed, it’s simple, the @RenderBody mentioned that the content page will be displayed in that area. 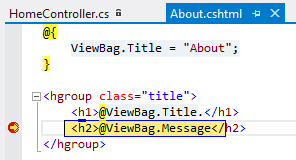 While debugging our application we have noticed something named ViewBag. It's a dynamic data dictionary. As we have used Internet Application Project template the code is generated with Membership management. Let’s have a look into that. 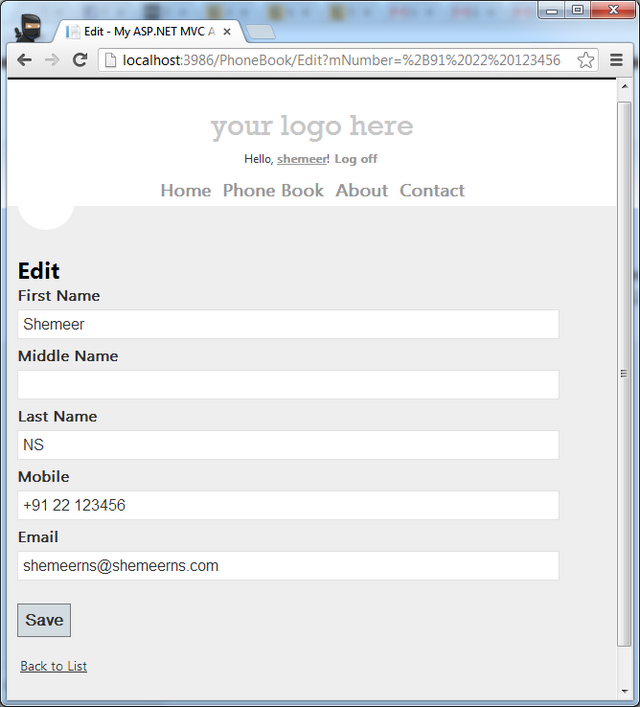 Now I’m going to create a User named Shemeer using the Register link. If you want you can place a breakpoint on AccountController’s register action. 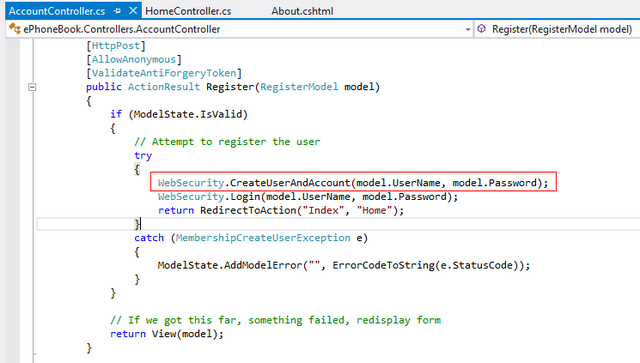 When I click ‘Register’ Button it reaches the WebSecurity.CreateUserAndAccount(). 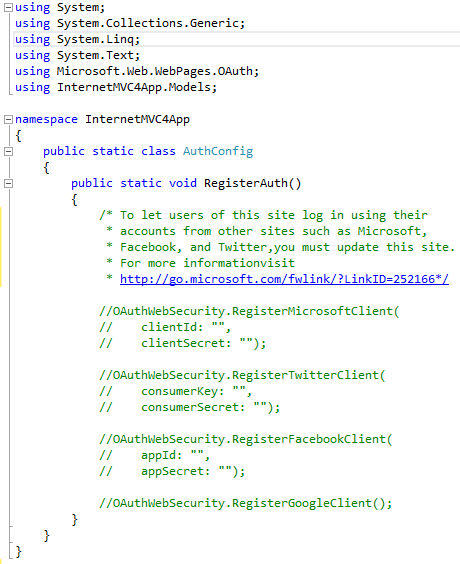 This method saves my credential to the aspnet* database. Wondering J this database was created automatically as part of memebership management and this database by default resides under the App_Data folder. 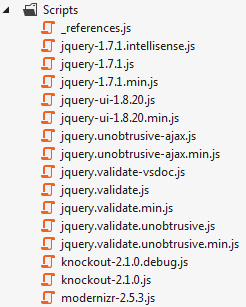 Apart from the generated code I’m just going to add some more pieces to this MVC Web Application. 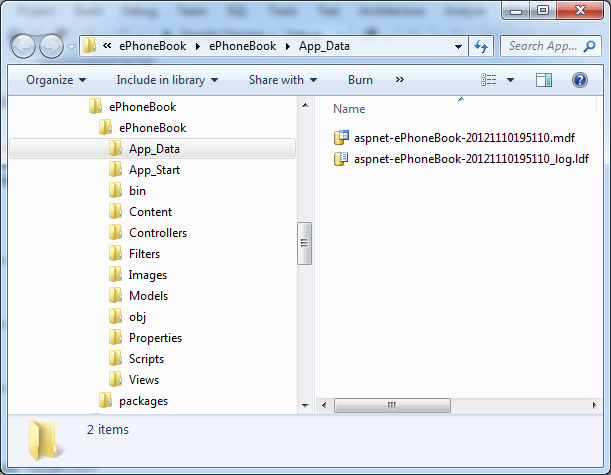 I will be publishing a full fledge ePhoneBook on ASP.NET MVC 4 later. This sample code will help you to get more understanding on MVC 4. The first thing I’m going to do is adding a PhoneBook Model class . In this class I have mentioned the validation attribute for the elements. 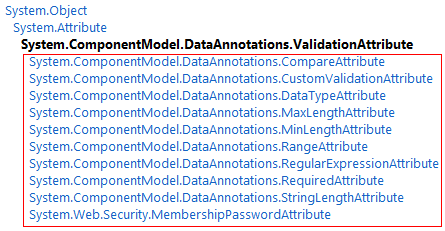 The ValidationAttributes are comes from System.ComponentModel.DataAnnotations. There are multiple validation attributes available and all are self-descriptive. The above image shows the available validation attributes. 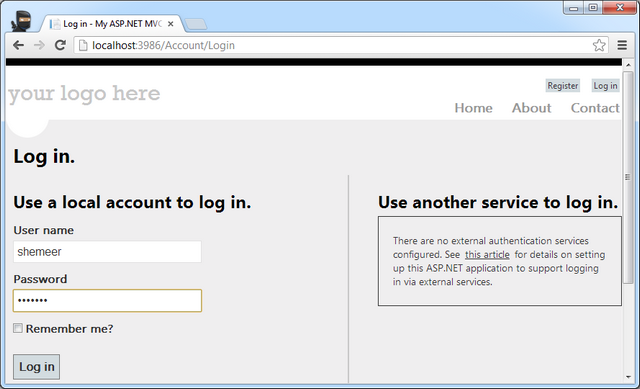 Read More on Validation Attribute from MSDN. Now let’s add required views (Create, Edit, Delete, Details, List), to add the views just right click on the View folder and click on Add->Views menu. Now I’m going to add the Listing view, I have given the View Name as “Index” and selected the 'create a strongly typed view' Model from the Drop-down so that the code will be generated accordingly to the Model. If the created PhoneBookModel is not showing in the dropdown then build the application and then check. When you click on ‘OK’ button the Index.cshtml is ready. Now we need to add Controller actions for these scaffolding items. 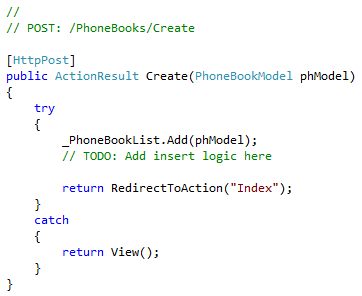 I choosed “MVC controller with empty read/write actions” controller template Now give the controller name as PhoneBookController. 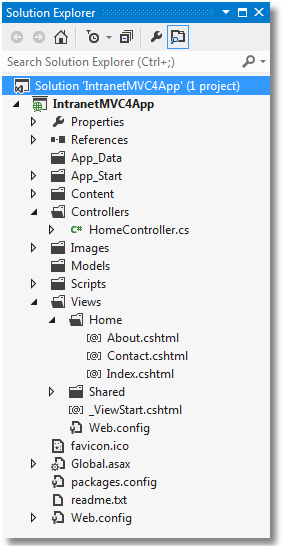 Note that MVC requires the name of all controllers to end with "Controller". If you see this method the return type is ActionResult, What’’s ActionResult. An action result represents a command that the framework will perform on behalf of the action method. The ActionResult class is the base class for action results. It Encapsulates the result of an action method and is used to perform a framework-level operation on behalf of the action method. For the “Delete” method we don’t have any special User Interface that’s whyonce the entry is deleted we are returning the “Index”view. Edit page looks like below, all validations are working as per the validation attributesin model. 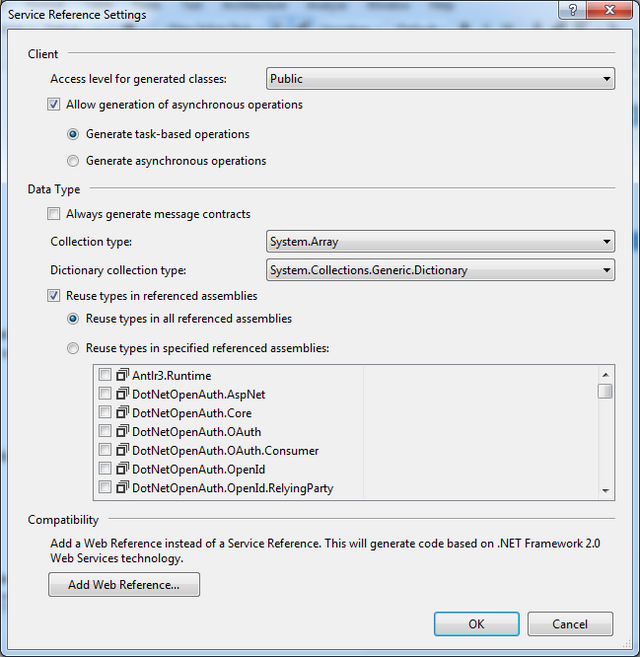 ASP.NET MVC relies on Convention over Configuration. If you want to make your website development easy and productive it's important to understand the Project Items or Application Folder Structure of an ASP.NET MVC Application. 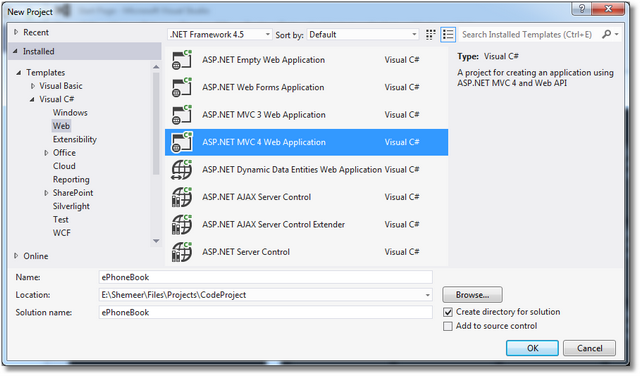 In this article I will explain the Project Items of an Internet Application Template of ASP.NET MVC 4. If you are new to MVC then you might want to check my previous article on Introduction to MVC 4. I hope you will enjoy this article.I have put my time and efforts on all of my articles, Please don't forget to mark your votes, suggestions and feedback to improve the quality of this and upcoming articles. 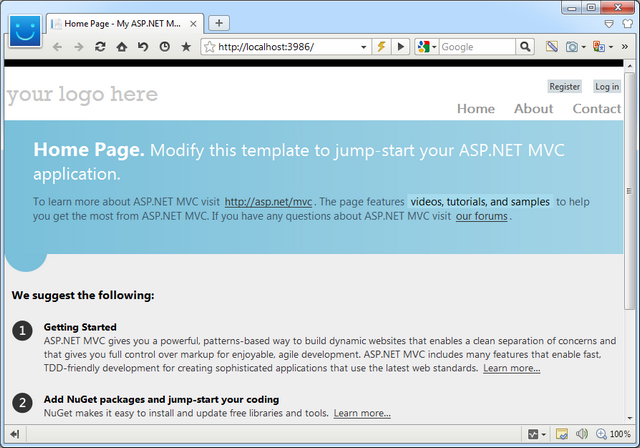 While creating a new application, as of now there are six different Project Templates available with ASP.NET MVC 4 . 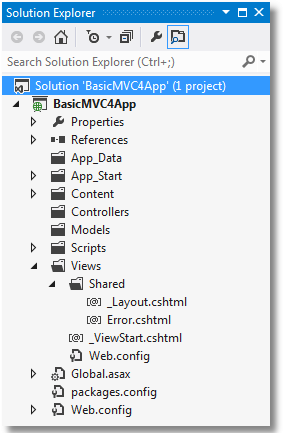 If you have not yet explored all the project templates with MVC 4, please check my MVC 4 - Introduction article. All project templates gives a common structure, some of the templates are having some different files and or folders for specific purpose. 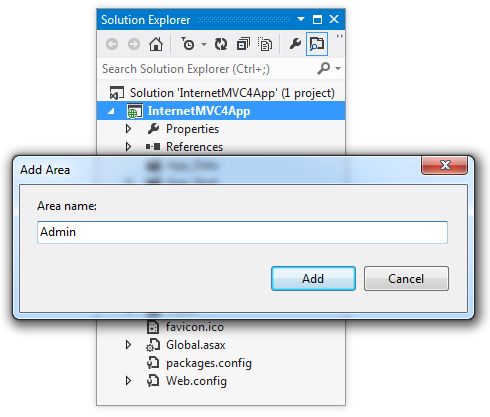 The below given screen-shot is of Internet Application Template of MVC 4. It’s very important to know the structure of application and file/folder conventions. In this article I’m going to explain all the above project items from a beginner’s perspective. 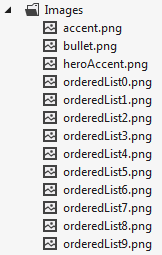 For getting a clear picture I have added more files and folders to the newly created solution. 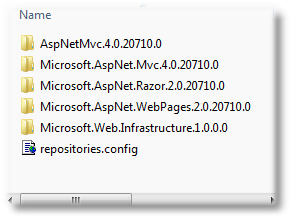 Some of the folders are not exactly useful for ASP.NET MVC but still I have added that folders too so that a new comer also can understand which is used for what. 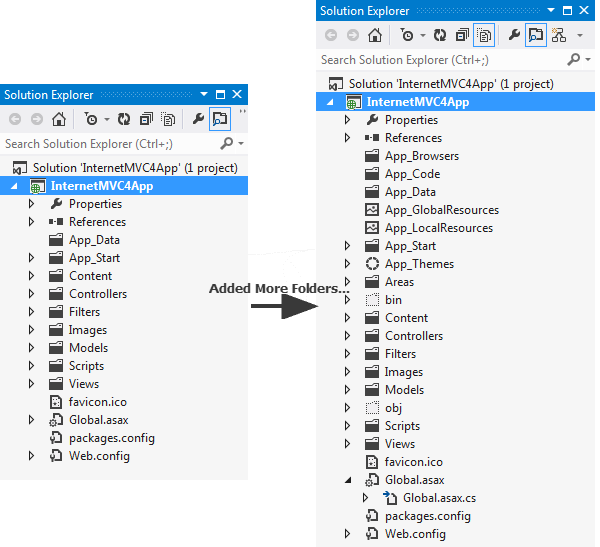 Lets explore the Files/Folders from the above Solution (InternetMVC4App). Note: The attached files doesn't have any functionalities implemented, it's just the application used for this article. Solution is a grouping of one or more projects that work together to create an application. 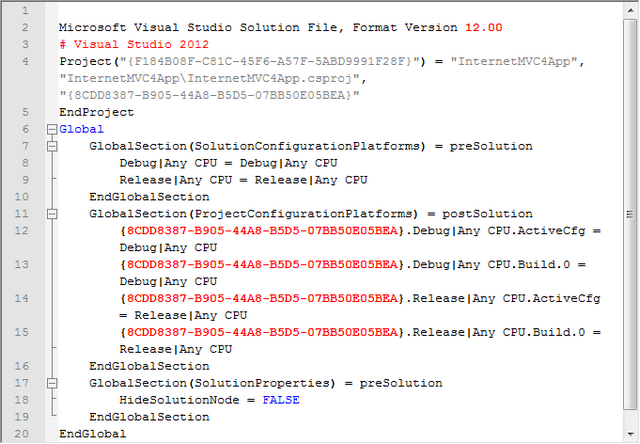 In a simple way we can say a solution is a structure for organizing projects in Visual Studio. 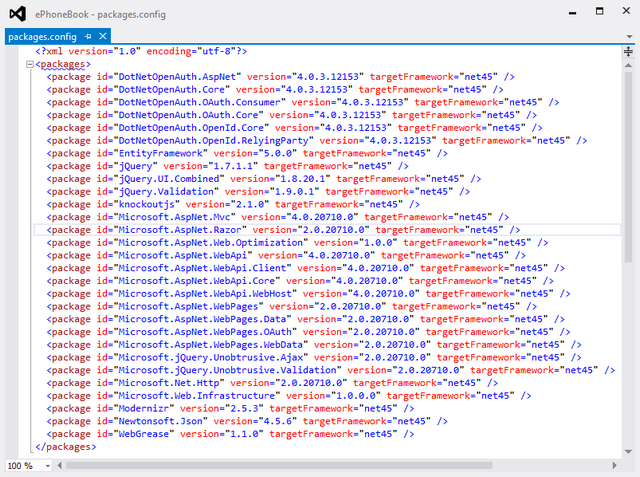 The project file is an XML document that contains all the information and instructions that MSBuild needs in-order to build your project, like the contents to include, the platform requirements, versioning information, web server or database server settings, and the tasks that must be performed. 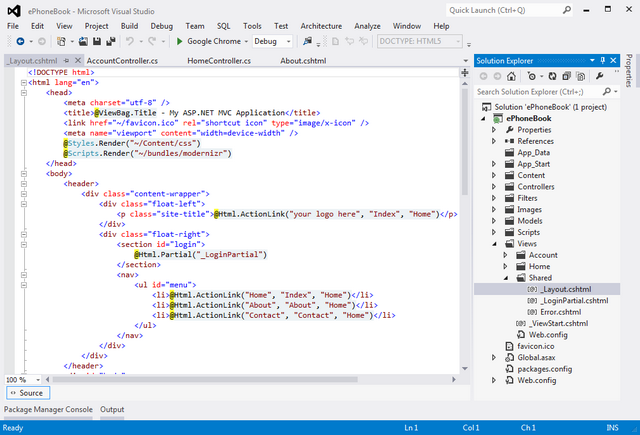 Every Visual Studio project includes an MSBuild project file, with a file extension that reflects the type of project—for example, a C# project (.csproj), a Visual Basic.NET project (.vbproj), or a database project (.dbproj). When talking about the "Properties" Folder, the first thing I wanted to mention is the AppDesignerFolder entry in project file in our case .csproj file. Properties folder is the first folder in the project node. If you expand the "Properties" Folder, you can see a file named AssemblyInfo.cs. 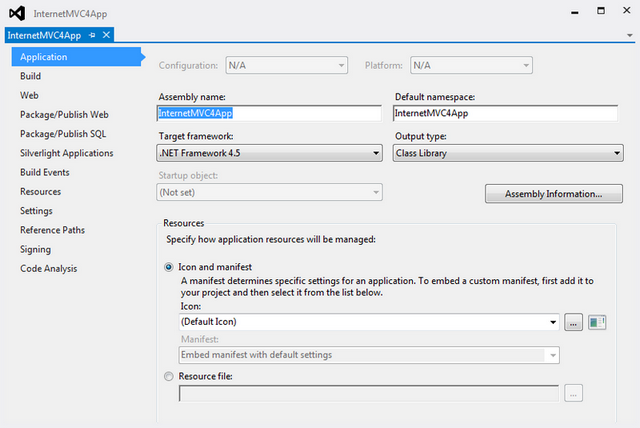 The below given screenshot shows the assembly version details in the 'properties' window of assembly file. If required, the properties folder name can be renamed but we need to update the .csproj file accordingly. If you are deleting the file AssemblyInfo.cs or folder Properties then the assembly details won’t be available in the details tab. The below given screenshot shows the assembly version details after deleting the folder or file. The above image shows default values for assembly details. These are assemblies that have been referenced in our current project. If you want to add any assembly reference or any service (WCF / Web Service) reference you can add it from here. To add an assembly reference just right click on the Reference folder and click on the 'Add Reference' menu, please refer the below screenshot. Once you click on the above (Add Reference) menu then a popup will be shown like below screen, select the required assembly and click on OK.
give the service URL ( you can give .svc or .asmx URL here) if you want to get the old Add Web Service menu then click on 'Advanced' option there you can see the 'Add Web Reference' menu. 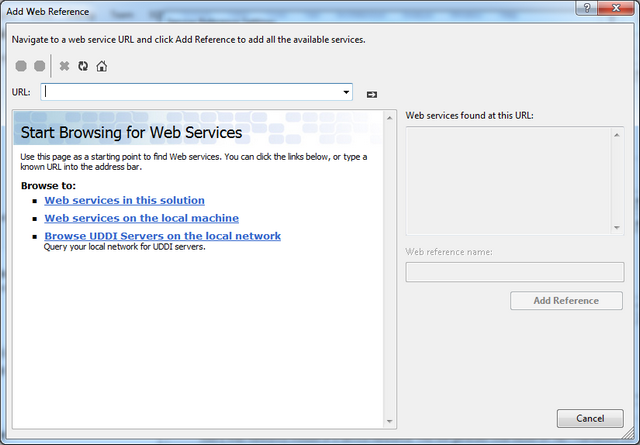 After clicking on 'Add Web Reference' menu , now you got the old Web Service screen where you used to give .asmx URL. App_Browsers folder contains browser definitions ( .browser files). Browser definition files contain definitions for individual browsers. 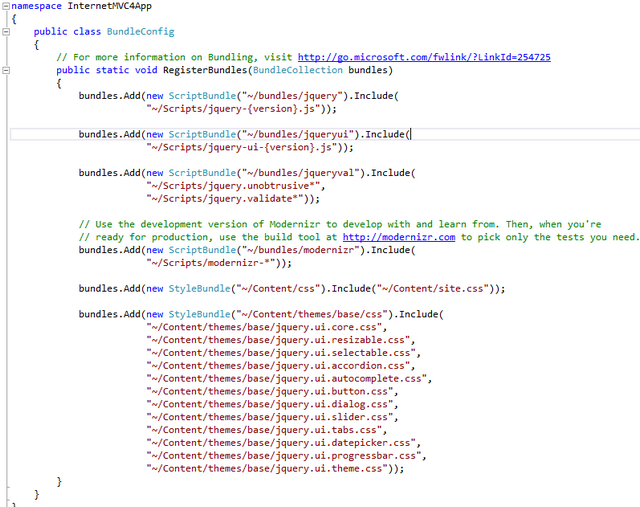 At run time, ASP.NET uses the information in the request header to determine what type of browser has made the request. 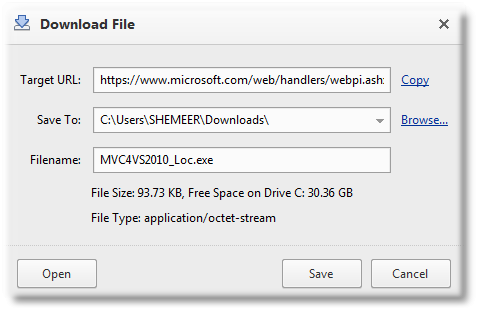 Then ASP.NET uses .browser files to determine the capabilities of the browser. 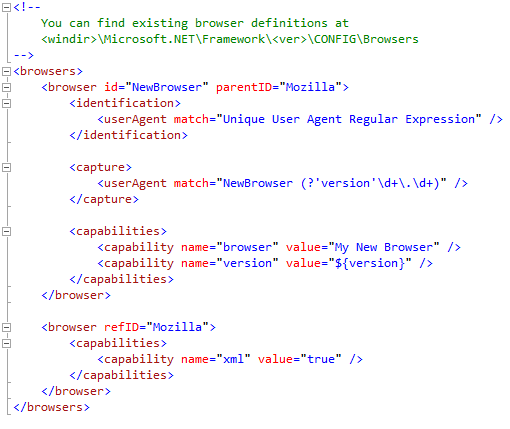 Browser definition files were introduced in .NET Framework version 2.0. 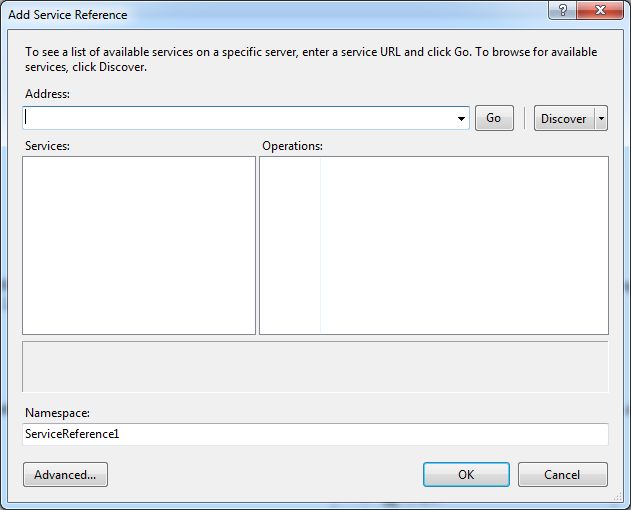 In earlier versions of the .NET Framework, the browserCaps element was used to define browser definitions in configuration files. here [VERSION] is the framework version that you have already installed. If you want to change the definitions of any of these browser definition files, Just copy the appropriate file to our project's App_Browsers folder and modify the definition as per the requirement. The below screen shot shows the content of newly added BrowserFile1.browser file, We can see that it's just an XML file that describes the capabilities of the browser. 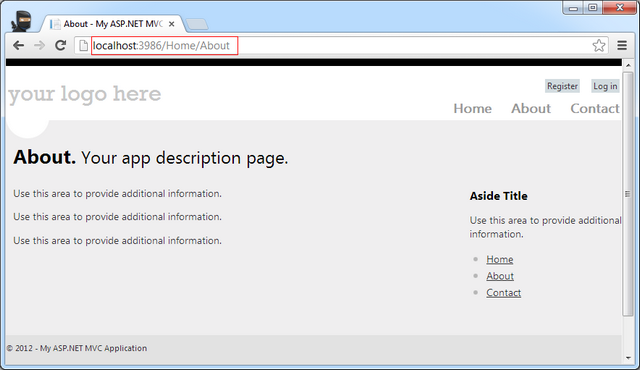 Read more on Browser Definition File from MSDN. App_Code is used for keeping class files , typed objects etc. Code from the App_Code folder is referenced automatically in our application.The App_Code folder can contain subdirectories of files, which can include class files that in different programming languages (eg:- .cs,.vb). The folder will be disabled if already that folder is added. You can see that the App_Data is disabled as its already exists in our application. This folder is meant for keeping data files such as XML, .mdf, .mdb files. In our default MVC template this folder is used to manage membership and role information. If you are using App_Data folder then you can mention the folder as |DataDirectory| (enclosed in pipe symbols) in connection string. |DataDirectory| is a substitution string that indicates the path to the App_Data folder. The files from the App_Data folder are safe as IIS will not process any files from this folder. You can find a sample code of DataDirectory in a project here App_Data in real application. App_LocalResources Folder contains resources (.resx and .resources files) that are associated with a specific page, user control, or master page in an application. AuthConfig.cs files helps us to login with our social networking sites like Facebook, Twitter, Google etc. BundleConfig.cs is used to register bundles used by the Bundling and Minification. The below given image shows how the scripts are adding in the .cshtml file. FilerConfig.cs is used to register global MVC filters. WebApiConfig.cs is used to register Web API routes. The main purpose of App_Start and containing files are to move configuration logic from Global.asax to set of static classes in the App_Start directory. App_Theme folder is used to apply styles/themes to web application. We can have multiple themes created for our application and also if we want we can problematically change the theme of our application. We can apply the theme from the web form or from the web.config file. App_Themes folder is used in regular ASP.NET but there are other different ways also to implement themes in ASP.NET MVC . ASP.NET MVC allows us to partition our web application into smaller parts using "Areas" Areas provide a way to separate a large MVC Web application into smaller functional groupings. An area is effectively an MVC structure inside an application. An application could contain several MVC structures (areas). I have named the area as "Admin" and after clicking on "Add" button a folder created with "Areas" with subfolder "Admin". The "AreaRegistration.RegisterAllAreas(); " entry in Global.asax's Application_Start will take the responsibility of registering all the Areas. Other wise you can also get the menu from the Solution Explorer itself. The compiled assembly for your MVC application is placed here, along with any referenced assemblies that are not in the GAC. 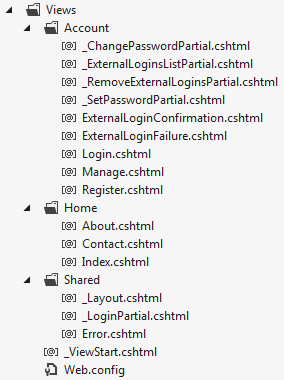 This folder contents are not served by IIS. Click here to the contents of bin folder. 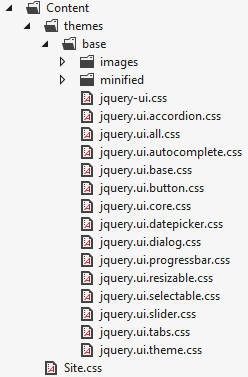 This is where we put our static contents like CSS, Images. This folder is just a convention and it’s not mandatory to put our static files in this folder.. This is where we put our controller classes. This folder is just a convention we can create our controller classes any where in the application. 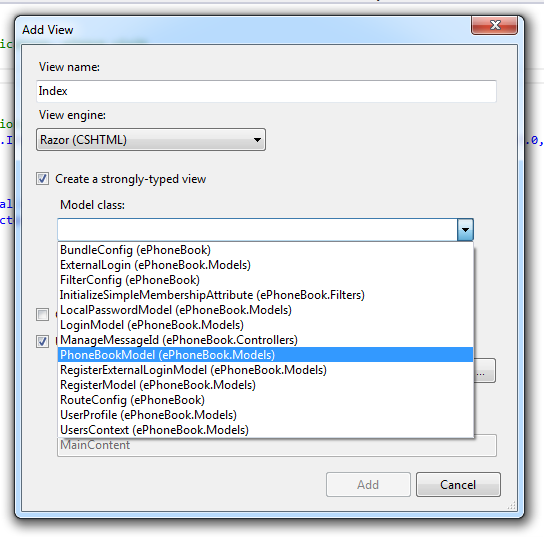 MVC will recognize any class that implements the IController interface as a Controller regardless of the location. All Images are kept in this folder and this folder is being referenced from the Content\Site.css. This is where you put your view model and domain model classes. This is a convention and we can define model class anywhere in the project or in different project also. This directory holds layouts (master-page in-terms of web forms) and views which are not specific to a single controller. Views or Partial Views specific to that folder or single controller. This is not the configuration file for your application. 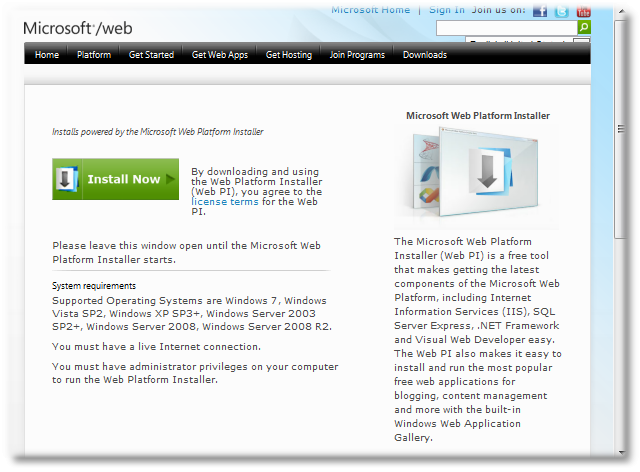 It contains the configuration required to make views work with ASP.NET and prevents views from being served by IIS. This is the favicon for our web application. This is the global ASP.NET application class. Its code-behind class (Global.asax.cs) is the place to register routing configuration, as well as set up any code to run on application initialization or shutdown, or when unhandled exceptions occur. This file is used by NuGet. 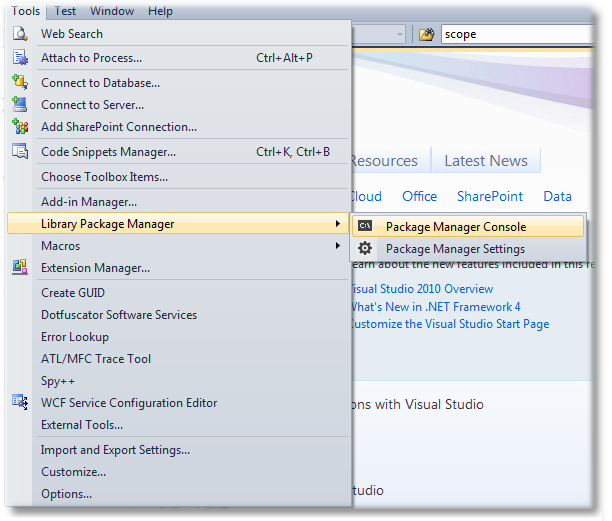 While creating the project itself the IDE interanlly used NuGet for installing packages. 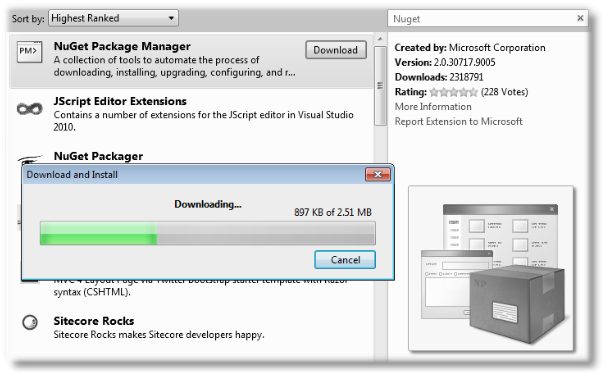 This file is used to track the installed NuGet packages with their respective versions. View Engines are responsible for rendering the HTML from your views to the browser. The view engine template will have different syntax for implementation. 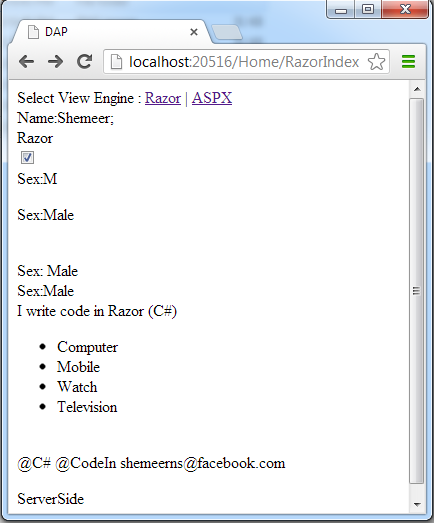 Currently there are few number of view engines available for MVC and In this article we will go through the Razor and ASPX view engine. I have listed some of the available view engines for ASP.NET MVC in another article , click here read more on different view engines. In this article I will take you through the Razor, the most opted view engine and the ASPX, the legacy view engine. 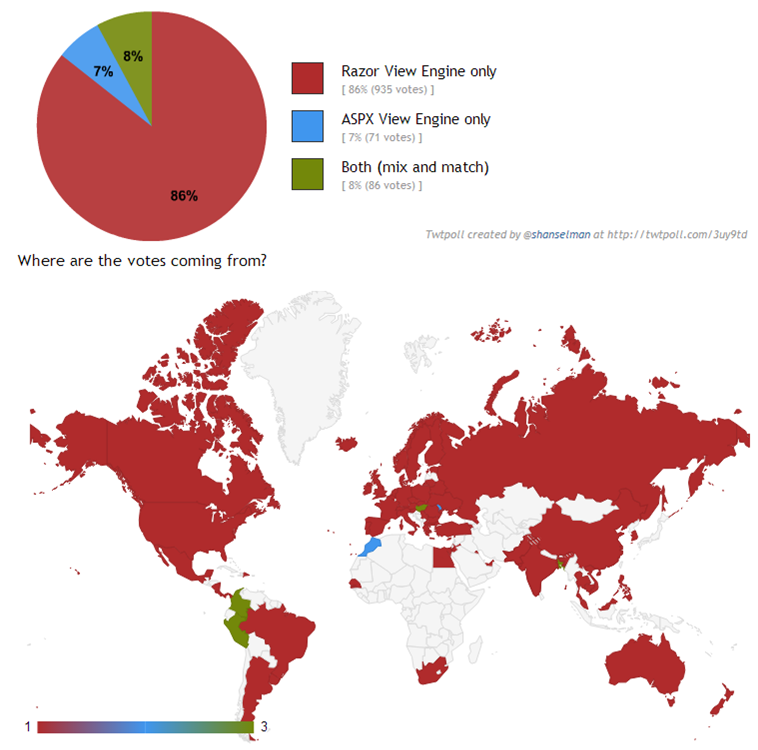 The Razor view engine is an advanced view engine from Microsoft, packaged with MVC 3. Razor using an @ character instead of aspx's <% %> and Razor does not require you to explicitly close the code-block, this view engine is parsed intelligently by the run-time to determine what is a presentation element and what is a code element. 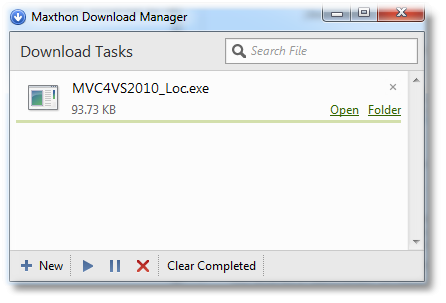 In my opinion Razor is the best view engine available for MVC as its much cleaner and easy to write and read. This view engine is compatible with unit testing frameworks. It is very difficult to implement unit test with ASPX view engine and the other available view engines doesn't provide anything related to testablity in their respective sites. This is the default view engine in MVC 3 and MVC 4. 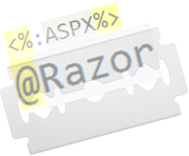 Web pages with Razor syntax have the special file extension cshtml (Razor with C#) or vbhtml (Razor with VB). 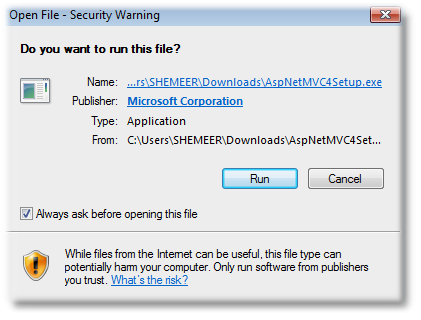 The syntax for writing views with this engine is the same syntax that the ASP.NET Web Forms uses and the file extensions are also taken from ASP.NET Web Form (.aspx, .ascx, .master) . The coding will give us the memory of legacy ASP style. This is the default view engine for MVC 1 and MVC 2. Let us start exploring the syntax differences and other major points. If you came from the legacy ASP style coding then you will feel much comfortable with ASPX View Engine and if you are comfortable with C# language then you can easily go with Razor view engine. Let's go thrugh how we can use Razor and or ASPX view engine in our application. 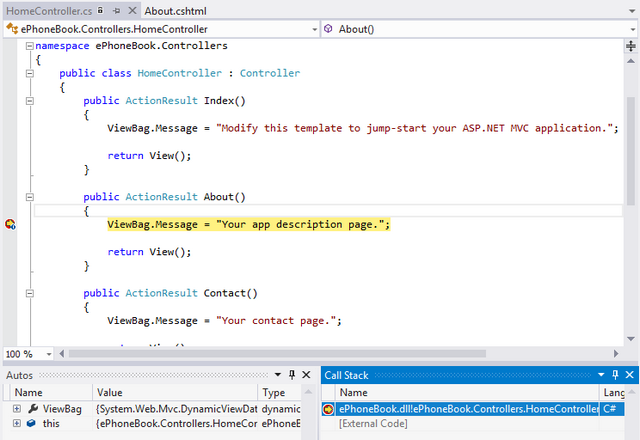 Note: All code samples are given in C# language. All Sample code outputs are shown at the end. [Codes are for demonstration purpose and may not be following all best practices]. 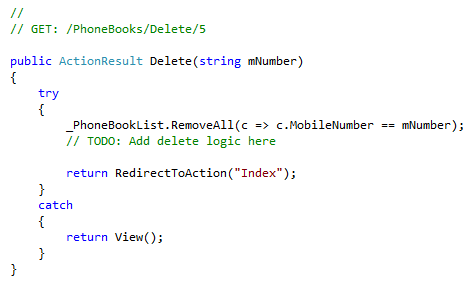 If you are inside a C# code block then you can also use // and /* */ comment delimiters. The below code shows comments in side a c# code block. We can easily write server side code blocks in the source html itself. The above code decalares some server side variables and the variables are got initialized with appropriate data in it. The above code block is written in a .cshtml file (Razoe C#). Below, the same code is written in .aspx (ASPX C#). The above declared variables will be used in the coming sections. When working in a dynamic web page we often required to mix code and html, This section will expalin how code and markup can be used together in ASPX and Razor view engine. If you see the below code, I have used the previously declared variable inside an html tag and the view engine will intelligently parse the code in between the html tags. 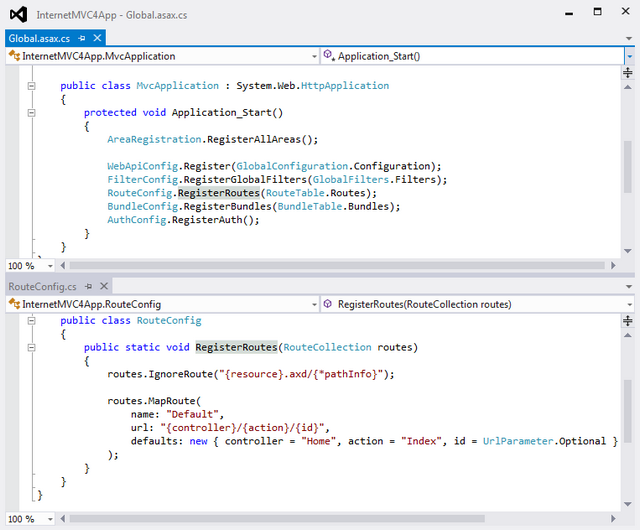 The above code is written for Razor(C#) and the below code will acheive the same in ASPX(C#) view engine. Suppose if you want to include a plain text inside a code block then we can use the <text> tag or @: for Razor view engine. So now you might be thinking how can we have some expression with a plain text, well it's simple. 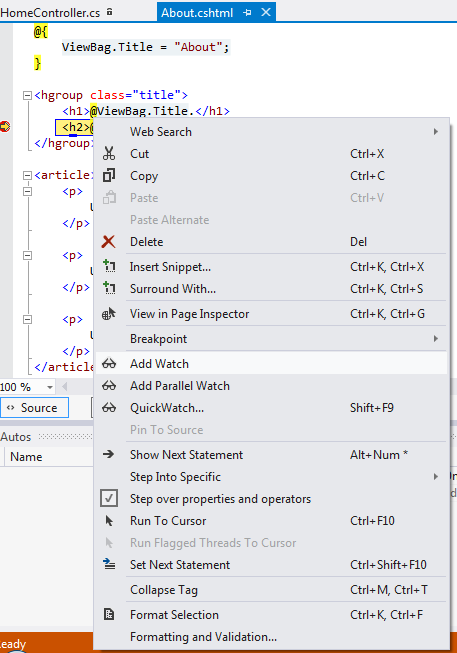 The above code will rendered with the value of ViewEngine and CodeIn variable. Html encoded values are acheived by the below codes. If you don't want to encode the data then you can use the Html Unencoded format. In Razor @Html.Raw is used for rendering Unencoded values and in ASPX <%= %> is used for the same. If you came across a situation where the html element's attribute values needs to be changed conditionally then this approach will be very useful. Below, you can see the <span> element class is aasigned with a server side variable. The above code was written for Razor(C#) and the same can be achived for ASPX(C#) as below. We can have other literals together with the server side variable. See the below example where @SpanClass evaluated to a string value and rendered with the string literals fontClass and blueClass. The below code shows the same in ASPX view engine. below sample sets a boolean server side variables value as checkbox's checked property. Explicit expression is very useful in below situations, below sample code is written for Razor(C#). Here instead of a IF conditional statement I have used conditional operator inline. Form Razor2 we can easily use "~/" for file path where as before Razor2 we used the below codes for the same. Conditional statement sample for Razor (C#). 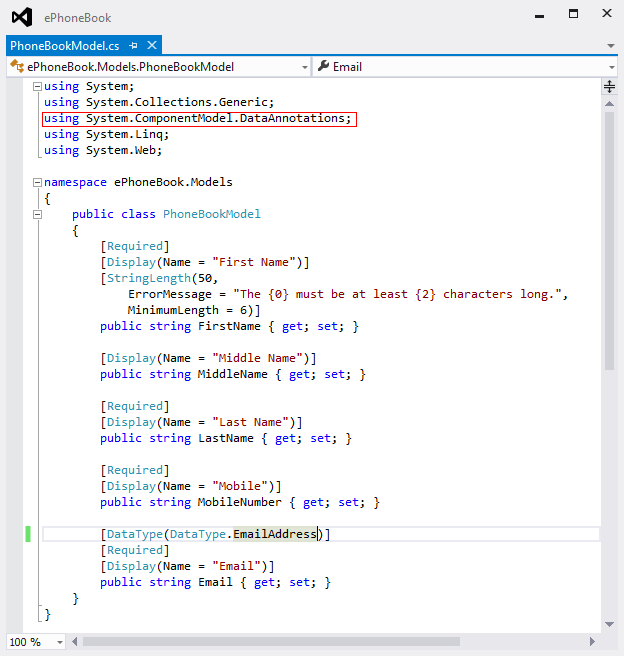 Conditional statement sample for ASPX (C#). The above usage gives us a very easy approach for rendering things conditionally. The below satement in Razor view engine is used for rendering the prouct list. Razor view engine is smart enough to identify the <li> tag as an html tag and the @item as a server side value. The <li> will be rendered multiple times with the list of products. Below satatemet is used for ASPX view engine to output the same as above. To demonstrate this I have created a static method named ServerSideCode in a class and called inside a <p> tag using the appropriate view engines syntax. 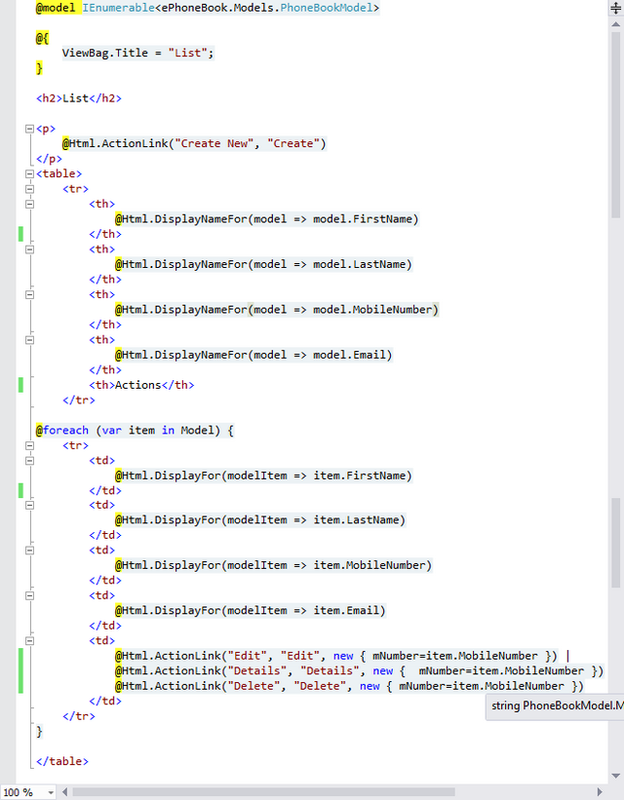 Razor delegates are nothing but they are templates build by C# and HTML. Check more details from Phil Haack article on Templated Razor Delegates. As I'm aware of the type. I have used Func<string, object> instead of using Func<dynamic, object>. and I have used the magic 'item' to get the value inside the Func<>. The @functions block in Razor helps you to define utility functions directly in the view. This functions should be created only when the function is specific to the view and can't be done using other conditional statement. By using @function we can separate view specific logic from controller. Razor language parser is very smart to konw the @ symbol is used for a static content or dynamic content. Let's examine the below code lines. The fist line will print @C# where as the second line will print @@CodeIn. The third one will be parsed intelligently by the parser and will print the email address shemeerns@facebook.com. The second line printed @@CodeIn because of the escape symbol the variable will not be considered/evaluated. To escape an @ symbol just add @@ and it will render a single @ symbol. Below, I have listed some of the comparisons with ASPX and Razor view engines. Razor uses @ symbol whereas ASPX uses <% %>. 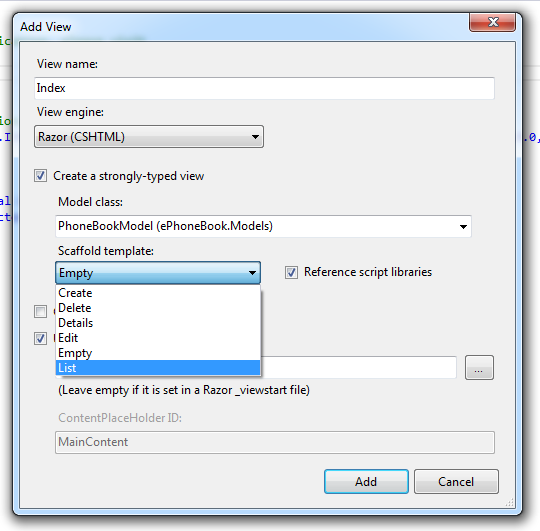 Razor view engine is launched with MVC3 and it's the defualt view engine from MVC3 where as ASPX view engine was there from the initial version and ASPX is default view engine for MVC 1 and MVC 2. 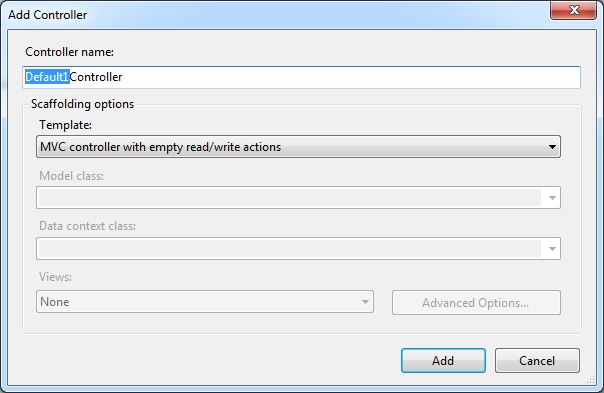 For acheiving similiar functionality Razor requires very less number of keystrokes compared to ASPX. Razor sytax is very clean and easy to learn than ASPX view engine. Razor very much supports TDD (Test Driven Devolopment). Razor view engine is little slower than ASPX view engine. So what's your preference, Razor or ASPX or any other view engines? I would go for Razor beacuase of the lightweight syntax, readability, maintanability, TDD, and more. You can download the application and try yourself. Note: All the codes are just to demonstrate the functionality.